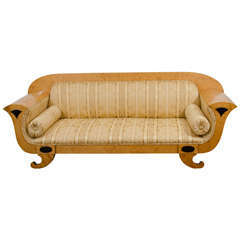 Reproduction of 19th century banquette. Completed banquette shown for reference only. Five frames available. Price includes upholstery in COM (customer's own material). Louis XVI style settee with grey painted wood frame. 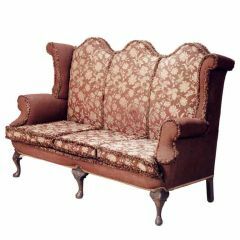 Upholstered in striped silk with brass nailheads. France, circa 1920. 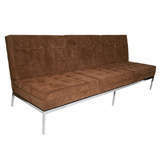 A beautiful example of a sofa. 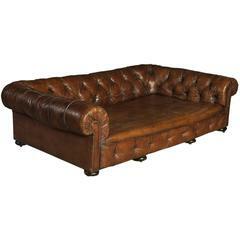 Triple camelback George I style sofa with rolled arms, mahogany legs and original fabric. 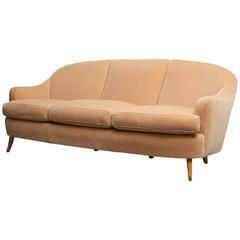 A Classic shape just waiting to be reupholstered!